This year’s winner of the Citizen Participation Award goes to the Kings Park Civic Association and Kings Park Chamber of Commerce. While Kings Park residents take delight in many of its aspects including the nearby parks and beaches all within a short distance and easy rail access to NYC, their downtown has seen some challenges. It has been difficult to attract and retain businesses along Main Street. Over the past decade, the Kings Park community has become increasingly concerned over the condition of Main Street and the surrounding downtown area. In 2015, the Kings Park Chamber of Commerce and the Kings Park Civic Association partnered together to sponsor a public process for a downtown revitalization plan that was sourced from the local community and stakeholders. They reached out to Vision who, along with a volunteer design team, developed a Revitalization Action Plan that would work for Kings Park residents. The goal was to hear from the community first without the interference or limitations of government. The first public meeting to develop this plan was held with over 300 residents attending and providing input of their hopes for the downtown. Prior to the main meeting, a smaller group of residents joined the design team for a walking tour around the downtown noting the conditions of pedestrian facilities and building facades, the number of vacancies, and other challenges affecting the overall health of the downtown. During the public meeting, several exercises were done to gather different types of input including an image survey, group design tables, and a question and answer session. Following this meeting, Vision continued to meet with the Civic and Chamber to ensure that the draft plan fully reflected the community’s vision. After the action plan was further developed, a second public meeting was held, again with over 300 participants. The draft was presented to the community for further input and to clarify details of the plan. Community concerns about multifamily housing and other issues were addressed during those public meetings. From these public meetings, the Action Plan was finalized and presented to the town board in the fall of 2016. Many of the recommendations in the Action Plan call for additional development to increase foot traffic along Mains Street. To grow their presence on Main Street, any new development would require sewers in order to manage the wastewater generated. The Civic and the Chamber along with the Long Island Lobby Coalition lobbied NYS for funding that was eventually secured by Governor Andrew Cuomo and NYS Senator John Flanagan with assistance from Suffolk County. In 2017 Kings Park was granted $20 million in state funding in order to construct the system. 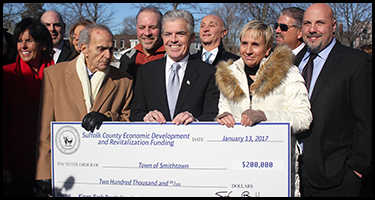 In early 2018, the Town of Smithtown hired a team to develop a formal master plan for the downtown including zoning modification recommendations and a GEIS for the future development. The plan which is currently underway will help to guide new development once sewers are a reality. While the plan for sewers is underway, the community organizations have begun to address many of the items identified as low hanging fruit. They have planned community-wide events and festivals to attract people to their downtown and boost their local economy. Without the Kings Park Chamber of Commerce and the Kings Park Civic Association partnering together and reaching out to the Kings Park community, there would not be the momentum to move revitalization efforts forward today.